While the British Empire was depending foremost on its navy to defend its interests, it also had modern and efficient aircraft, and a small army, but very well equipped and trained. Its armored forces were not at all numerically equal to France or Nazi Germany, but qualitatively of good level. 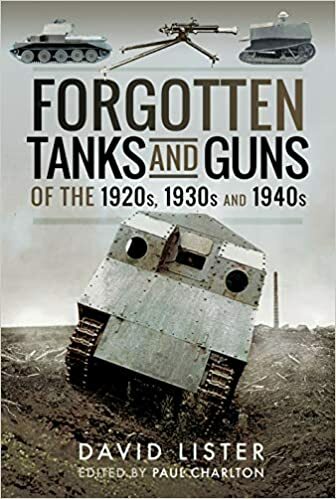 This was the case mostly thanks to a booming export production in the thirties (mostly Vickers) and many tests, exercises and authorship of the idea of mechanized warfare (in fact the basis on which the Blitzkrieg was founded), with revolutionary concepts such as the Carden-Loyd tankette, or the adoption of the Christie suspension for its cruiser tanks. In 1939, besides the colonial forces stationed around the world, mainly made up of infantry and artillery, the heavy mechanized forces were included in the British Expeditionary Force commanded by Lord Gort, formed in 1938, and landed in France soon after the declaration of war on September 3. Reduced in number (one tenth of the Allied forces, France, Belgium, Holland, Denmark included), but of very high combat value, the BEF included 158,000 men, arrived in five weeks, with 25,000 vehicles, artillery and support. Final deployment was completed in May 1940, in 10 divisions, assisted by 500 units (approximately 400,000 men). The majority of the forces were assigned to the French-Belgian border, but some units went and stood behind the Maginot Line. These forces were highly mechanized and consisted mainly of trucks and artillery tractors, armored cars and tanks, classified according to the custom of the time, in cavalry tanks (Cruisers), Scouts (Light) and Infantry. But because of the turn of events, most of this hardware was lost on the the way to the Dunkirk beaches. Only the Matilda seemed to resist the German onslaught, when counter-attacking at Amiens, but the Germans 88 mm (3.46 in) Flak guns, superior coordination and air power definitely broke this courageous but futile attempt. Many of the models already developed or under development in 1940 entered mass-produced, with many versions and variants until the end of the war. However, some new tanks appeared due to the precious war experience gathered, which ultimately led to the awesome Centurion, perhaps the world’s first modern MBT or “Main Battle Tank”. The best suited tanks for armored offensive appeared to be of the cruiser gender. After the Cruisers III and IV, a complete redesign of the suspension, using for the first time the Christie system, led to the design of the Mark V Covenanter and the Mark VI Crusader. The latter gained fame in the North African campaign, but it was obsolete by 1943 and new models had arrived: The Cavalier, Centaur and, most famous, Cromwell (Mark VII), all equipped with the new 6 pdr (57 mm/2.24 in) antitank gun, improved engine and armor. When the African campaign started, the British armored force was left with second-rate tanks, most of nearly obsolete models, like the Light Tanks Mk.II/III, Mk.V and Mk.VI and tankettes, and the obsolete Vickers Medium Mark II. There were also a few Cruisers Mk.II/IIIs. 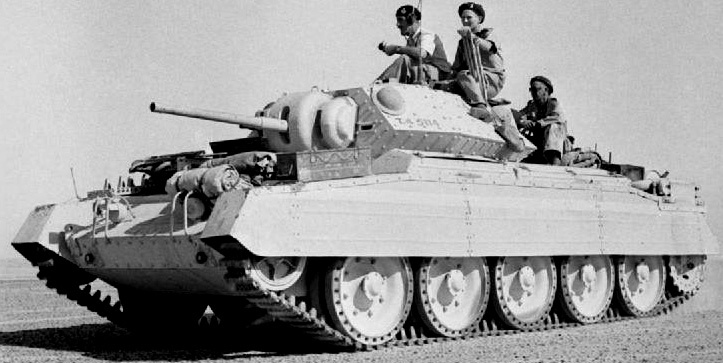 By 1940, as the Italian threatened Egypt from their Eastern African colonies and Libya, some armored reinforcements were sent, and nearly all available tanks when, in September 1940, the Germans ceased their air offensive over Britain. At the same time, production was re-centered around a few models: The infantry tank Matilda II, the Cruiser tank Mk.IV, and the freshly arrived Valentine. 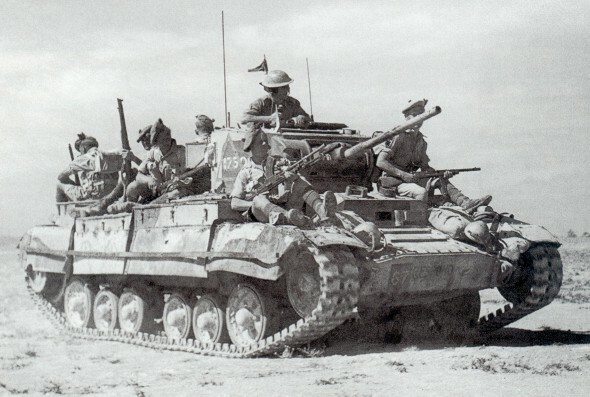 Since local Italian armor was not really impressive, the bulk of the British light tanks had been based in North Africa and in the eastern colonies (Singapore, India, Burma). By the fall of 1940 and until the fall of 1941, a not well-known offensive saw these second-rate tanks, alongside many British and Australian armored cars, fighting off the Italians in Eritrea and Somaliland (East-African campaign). But by the start of 1941, after a series of humiliating defeats, the Regio Esercito had been pushed back and even chased out from Libya. The British forces had reached Tobruk and now threatened the Italian presence in Africa itself. Hitler, unwilling to let his ally lose this precious position against British main eastern trade roads and supply lines, sent two divisions, the core of a future “Afrika Korps”, under the command of one of the most praised German generals in history, Erwin Rommel. The year 1941 was a complete reverse of the initial successes of the British army, which was pushed back all the way to Egypt. By mid-1942, several epic battles, were tanks played a vital part, contributed to slow down the Italo-German advance, until the turning point at El Alamein. By mid-1941, the British army had received two new tanks. First wasthe brand new Crusader, with a Christie suspension which gave, on the flat battlegrounds of the North African theater, stunning performances. But speed itself was not sufficient, especially against German tactics using bait forces and ambushing antitank units. The second tank was not British but American, on insisting British request. It was a medium tank with powerful armament -but in an awkward configuration- , good armor and mobility. Nicknamed “the Iron cathedral”, the M3 served as the Lee in US service, and the Grant in British service, with distinctive modifications. Despite its shortcomings, it was dependable and contributed to stopping the German advance literally miles from the Nile, at El Alamein, a remote railroad junction. But most of all, the future “Desert Rats” were now led by a soon iconic figure, Bernard Montgomery. By the fall of 1942, the first British M4 Shermans arrived en masse through Alexandria harbor, but the bulk of VIIIth forces still comprised M3 Grants, M3 Stuarts, Crusaders, Cruiser III-IVs, Matildas and Valentines. All these forces were patiently and carefully gathered for the great African offensive of El Alamein (second battle), planned by Montgomery in October-November 1942. At the same time, the first US Army western front commitment of the war came in French Algeria, with operation Torch. This giant pincer movement was designed to deliver the coup de grace to the Afrika Korps and the remainder of the Italian forces, now retiring to Tunisia. The Tunisian campaign was nothing but a though and bloody affair. 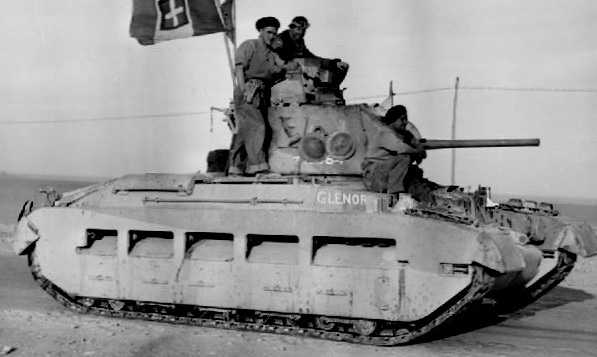 Tunisian muddy winter combined with a stiffened and well-ordered fighting retreat by hardened Axis troops was not what the Allies expected, and the arrival of general Kesselring with fresh reinforcements, including the brand-new Tiger tank, further increased the Allied disarray. As a response, British armor received new anti-tank guns, but to lead the assault, they also received the heavy Churchill tank, slow but extremely resilient and versatile. The last Crusaders had been phased out, and early versions of the Valentine had been converted with success into the Bishop SPG. Now obsolete Grants were sent to the Far East. They would go on to have a brilliant fighting career in Burma, until 1945. The Cavalier, Centaur and Cromwell, all based on the same requirements and very similar, arrived in limited numbers. Their new high-velocity gun and reliable engine proved more than a match for many aging Panzer III and IVs. The surrender of all Axis forces in Tunisia came in May 1943. The Allies, however, had not succeeded in completely destroying Kesselring’s army, which retreated in good order to Sicily. The Sicilian campaign, from July to August 1943, saw the extensive use of US Lend-Lease vehicles to compensate for the British losses, mainly Monty’s VIIIth army, comprising M2/M3 half-tracks, jeeps, trucks, M5 Stuarts, as well as M3 derived self-propelled artillery (US-built Priest and Canadian-built Sexton). During the previous desert operation, Lend-Lease Jeeps and Chevrolet trucks, modified and heavily armed, served with the famous LRDG (Long Range Desert Group), using effective hit-and-run tactics. The next campaign, starting in Italy in September at Salerno and Taranto saw a growing number of Canadian-built tanks, mainly Universal Carriers and the Sexton SPG. Now the mainstay of the British tank force, apart from the Shermans and Churchill, were the Cruiser VII (“C” models) and later versions of the Valentine. Soon after these landings, a new Italian government was formed, which decided to put Mussolini in arrest and quickly entered peace talks with the Allies. But, despite the defection of Italian troops, the offensive reached a standstill. General Kesserling was able to put a very sturdy resistance, helped by his hardened troops, some reinforcements and the Italian landscape. The Italian campaign dragged on until the fall of 1945. Before D-Day, the only attempted landing in occupied France had occurred on 19 August 1942. This was a complete failure, with a heavy price which was mostly paid by Canadian troops. This was also one of the first actions of the new Churchill tank. Already developed in 1941, the Churchill looked obsolete, and it was plagued by teething problems. At Dieppe, none of these heavy tanks made it farther than the beach, easy prey for the German artillery at point-blank range. The problem was not in the tank, but in the very stuff that composed the beach, tiny chert which clogged into the drivetrain and tracks. The Churchills were doomed. But this tank would prove its value in a matter of weeks in North Africa and especially Tunisia,. When all its defaults were corrected, it ended up as a very fine armored vehicle. It was extremely sturdy, roomy, reliable, and highly adaptable, and it could climb slopes impossible for any other Allied model. It became the staple of the Royal engineers for every duty imaginable, from D-Day to V-Day. The bulk of the British tank force during D-Day was made of US-built Sherman tanks. The British were not long to grasp the potential of this tank and quickly attempted a modification of their own, the Firefly. This was basically an up-gunned version, fitted with the long-barrel, high-velocity QF 17-pdr (76.2 mm/3 in), the British perfect “tank killer”, capable of knocking out any German tank of the day. It was used in conjunction with other models and proved really up to the task during the operations in the Normandy bocage and heavy fighting around Caen. The US devised their own upgunned version, the 76(w), which appeared not long after and became the next upgrade of all Sherman versions. The second most important British tank deployed was the Cromwell. Derived from the long line of “cruisers” and equipped with the same engine as the legendary Spitfire (the Rolls-Royce Meteor), the Cromwell was faster than the Sherman, but also lower, and equipped with the largely available and very efficient QF 6-Pdr (57 mm/2.24 in) gun. However, it was cramped and the small hatches too often condemned the crews to burn alive inside the tank. The Cromwell was chiefly used for training, and only equipped the 7th Armored Division and other elite specialized units, like the reconnaissance units attached to the Guards Armored Division and 11th Armored Division. Other important AFVs deployed at D-Day were the self-propelled howitzers, M7 Priest and the Canadian Sexton. Indirect fire could be provided quickly thanks to these vehicles, which turned out to also be efficient troop transports. So much so, that many other turretless vehicles were called for the task, summarily called “Kangaroo“. But these converted vehicles were all open-topped. The unique SPG designed to operate as a tank hunter was the 17-Pdr Archer, based on the Valentine chassis. Around 600 were produced in 1944, and they operated in France, Holland, Germany and Italy. These were characterized by a rearward-firing configuration. The A30 Challenger (Cruiser Mark VIII) made its debut in France in the summer of 1944. It was introduced with the new high-velocity 17 pdr (76.2 mm/3 in) QF AT gun, capable of dealing with German Panzer IVs and Panthers. However, its development took time, and the Firefly appeared cheaper to convert in numbers. So despite its advantages (it was faster and agiler), the costly and complex Challenger never saw action before July and August 1944, when the mulberries were operational, and only 200 were built, equipping British elite units, as well as Czech and Polish ones. Both concepts of tank hunter and cruiser tank were reunited in a single package, the Comet, first introduced by early 1945. The Comet was basically a Cromwell re-equipped with a specially adapted version of the deadly QF-17 pdr. An impressive package of speed, armor and firepower, which represented the peak of British experience facing German tanks. But it was not the last “cruiser”. As soon as 1943, the general Staff asked for a “Heavy Cruiser” (A41), which could withstand a direct hit from a German 88, be agile like the Comet and Cromwell, still be armed with an improved version of the QF 17-pdr and stay within the 40-tons limit to allow transport by the lorries. A mock-up was built in May 1944, with prototypes in early 1945 after many revisions. It is said that three pre-series Mk.I Centurion prototypes were sent to Germany before V-day, but the armistice was signed before they could participate in any action. However, they had a great postwar career and pioneered the “main battle tank” we know today. With nearly 6,400 machines produced in several sub-versions until 1945, the Dingo was one of the best armored reconnaissance 4×4 vehicles produced in the world. About 400 served during the campaign of France in the 1st Armored Division and the Northumberland Fusiliers; and in many theaters after. About 300 of these armored armored car were produced by the Rootes Group (Humber) and served with the BEF. These vehicles had a Boys anti-tank rifle and a Bren gun. After the Fall of France, 3600 more would be produced. -The rare Vickers Crossley 4×4 (model 25) was produced for Japan, whereas 100 “Indian pattern” were used by the Raj of India and the 6×6 Mark I was still during the war for training (to come). 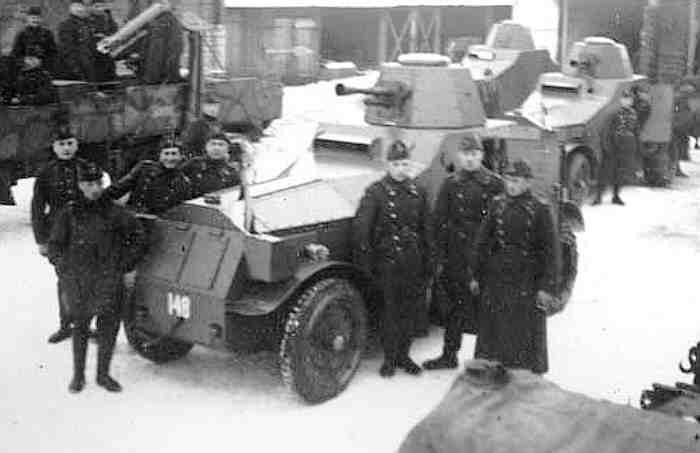 About thirteen IGA-1s 6×6 were also used by the Estonian defence Forces in WW2 and the model 26 4×4 by Argentina. -Guy Armoured Car: Only 101 of the “pre-production” prototypes for the famous Humber were built by Sydney Guy at Wolverhampton in 1939. Only four went with the BEF, all captured, the rest were used at home for training. -Lanchester 6×4: A rather rare 6×6 model developed in 1928 (34 built) and used overseas during ww2 (Malaya) and at home for training. Relatively similar to the Vickers-Crossley. -Humber armored car: One of the most successful ww2 armored cars. Developed from the Guy in 1940, 5400 were produced up to 1945. Armament was variable but in general a couple of a heavy Besa and light machine guns. Used as a standard for ground reconnaissance on all fronts. -AEC Armoured Car: A 4×4 monster built during the war and sturdy enough to sport the turret of the Valentine tank. It was one of the earliest example of a wheeled tank during ww2. -Coventry Armoured Car: A late (1943) ww2 attempt to design a standard wheeled armored car to replace previous models, only 220 built. -Morris CS9: Morris was a prolific prewar car manufacturer, but only produced 99 of its own armored car in 1938-39, the CS9. A sturdy 4×4 lightly armed and armored, it was quickly retired from the front line. -Morris Light Reconnaissance Car: Designed and mass-produced after Dunkirk (1940) at 2200 units, this light RC armored car was lightly armored and protected, but cheap to built and faster than the heavier CS9. However it suffered from reliability issues and had limited offroad capabilities. -Standard Beaverette: A desperate case of improvization, these were post-Dunkirk 1940. Called “Lord Beaverbrook’s pets” (RAF) they were hastily-made armored conversions for home guards defence. They were made of Standard car vehicles, 2,800 converted in a shot time and several series. They only served at Home. Mk.I (10 built), Mk.II (66 built) and Mk.III (34 built), 110 built in all. From these light tanks derived many models, including the 6-ton light tank widely sold for export. They were classified as cavalry tanks, light, fast, with a turret armed with a single gun, and a crew of two. Relegated for training until 1942. 34 of these improved Mk.IIIs with a new hull and suspensions were delivered. 22 of these three-men crew vehicles with a redesigned hull were built. 1682 built. By far the most common light tank of the BEF, the Mk.VI was produced until 1939, of which many were sent overseas. It used a heavy .50 cal (12.7 mm) machine gun, combined with a light machine gun (7.7 mm/0.3 in). 177 built. The A17 was a specific wartime version designed to be airborne. The Tetrarch served in Normandy, but, being unsatisfactory, they were quickly withdrawn. 125 built in 1938. Designed in 1937, a development of Major Giffard Le Quesne Martel’s tankettes, these medium tanks were the forerunners of the famous Crusader. 175 built. Closely derived from the Mk.I, it was equipped with a 2-pounder (37 mm/1.47 in) high-velocity gun, a heavy Besa machine-gun and a coaxial Vickers machine gun. 65 built. Derived from the Mk.II, this new medium tank had a Christie suspension, giving it a much better grip on rough terrain. They were built in part for the BEF, but quickly supplanted by the Mk.IV. 890 in all (225 Mk.IV and 665 Mk.IVA). Based on the Mk.III with improvements but with a far superior, sloped armor. It was widely used in North Africa . 1771 built in 1940-42. A largely improved Cruiser, built by LMS/Nuffield, which suffered from many design flaws, despite being the blueprint of the Crusader. It saw little combat and was mostly used for drilling. 5,300 in all. An all-around superior tank to the previous Cruisers, it made up the bulk of the British tank force during the African campaign. But, suffering from engine problems, relatively weak armor and armament, it was phased out in 1942. 500 built. 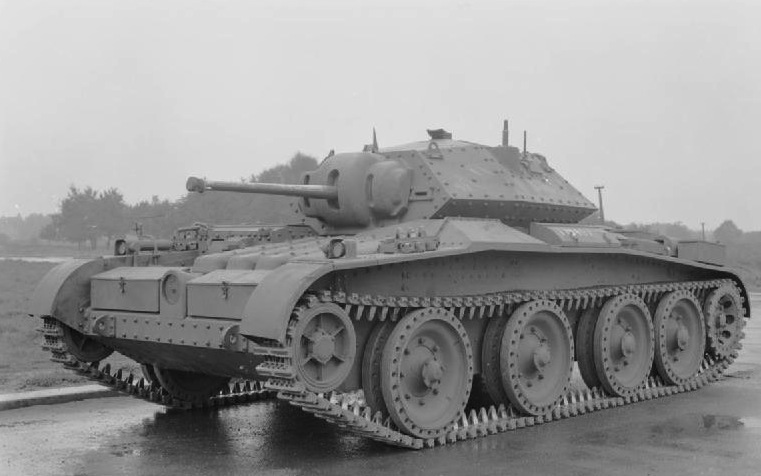 Also known earlier as the Cromwell I or A24 (Nuffield), it was basically an improved Crusader with a new turret, armor and 6 pdr. 4,016 built until 1945. Improved version of the Cavalier or A27L (the Centaur was at first known as the Cromwell II) with a Liberty Engine (by Nuffield). The Cromwell proper (A27M) was propelled by a more powerful Rolls-Royce Meteor, an adaptation of the famous Merlin propelling the Spitfire. This 1942 project, headed by Roy Robotham, was meant to carry the long 17-pdr gun. On paper, this was quite a formidable anti-tank gun, but incompatible with the turrets of the Crusader and Cromwell series. 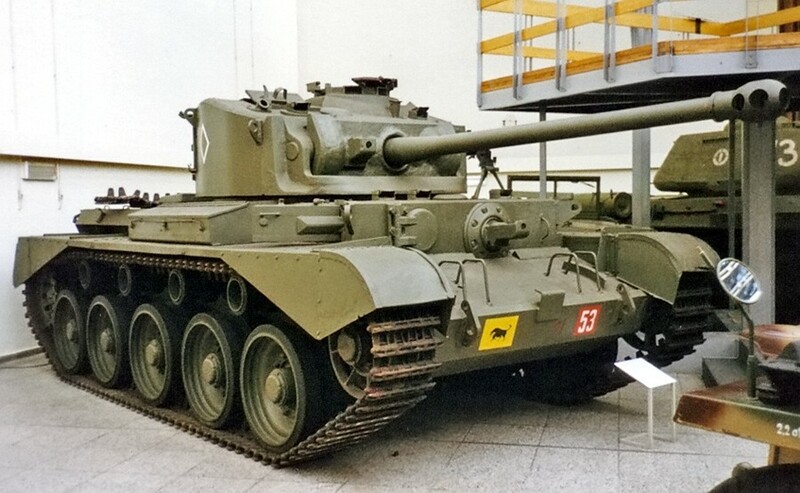 It was realized that the new tanks (Comet and later Centurion) would need at least two more years of development, so an interim solution was chosen with the modification of a Cromwell tailored to carry a larger turret ring for the 17-pdr. 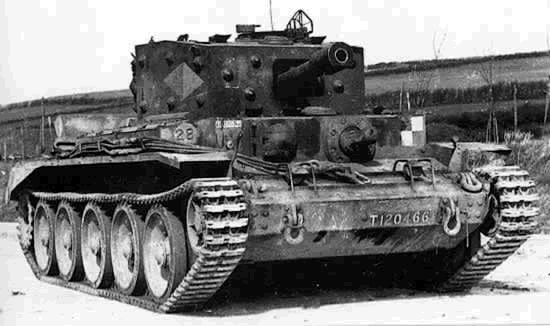 This resulted into the A30 design, basically a stretched-out Cromwell with an extra pair of roadwheels and many other modifications, including the removal of the bow machine gun to free space for the bigger rounds. The new turret was taller and, due to the strain added, compromise led to it having thinner armor than actually found on the Cromwell. After production started in February 1943, with 200 Challengers built by Birmingham Railway Carriage and Wagon Company, the General Staff declined any further order and canceled the project in November of that year. The few Challengers built acted as tank hunters until the end of the war. They arived in operations in August 1944 in Normandy, then northern France and the Low Countries. Many served with the 1st Czechoslovak Armoured Brigade and 22 were found in service in the Czechoslovak army until 1951 when provisions of Soviet-built tanks made it obsolete. 1,186 built in 1944-45. A product of Leyland motors, carrying the 77 mm (3 in) gun, better known as the legendary 17-pdr, the best piece of AT ordinance in the Allied arsenal by 1943. 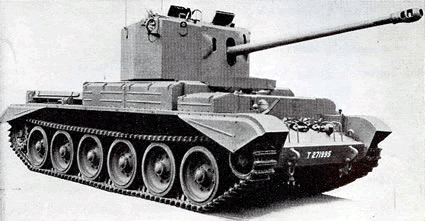 The Comet was also designed to correct the Cromwell’s flaws (track shedding and broken suspension problems). 140 built. This vehicle was slow and very well protected, with a simple caliber .303 (7.62 mm) heavy machine gun, it was a testbed for the next, better known Matilda II. 2,987 built by 1939. 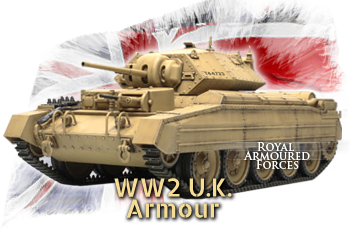 Called A12, Tank, Infantry, Mk II, it was a major best-seller among the British models. By 1939, about 300 were produced. They were a little faster, had a powerful and economical diesel and a high-velocity 2-pounder gun (40 mm/1.57 in). It was twice as massive and overall better protected than the Matilda I. Heavy tank by the standards of 1939. Matilda Black Prince, click the picture for more. 8,300 built until 1943. 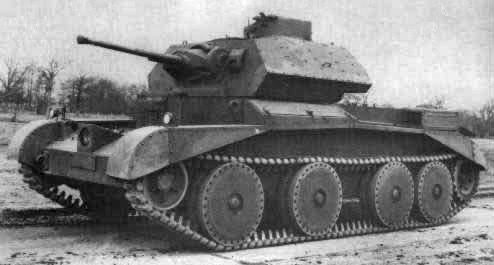 Designed internally by Vickers without a specific request from the War Ministry, the Valentine infantry tank was more compact and lighter than previous tanks of the type. It was not a priority, but received the endorsement of the War Office after the Dunkirk evacuation, being produced in many versions, steadily improved until the Mk.XI of 1943. 7,368 built. The Tank, Infantry, Mk.IV was one of the heaviest, but also most dependable Allied tanks during the war. Its sturdy chassis and well-protected hull served for many conversions and utility versions: bridge layer, minelayer/minesweeper, AVRE (Royal engineer corp), Petard (mortar), Oke and Crocodile (flamethrower), ARV (recovery), ARK (ramp). 660 built. Tank hunter armed with the 17 Pdr gun on the Valentine chassis, 1944. 2,000 built. Tank hunter armed with the 17 Pdr (76.2 mm/3 in) gun on the Sherman chassis, 1944. The Vickers Medium tank Mk.I was another famous interwar British tank. It belonged to the early twenties generation, fitted with a full traverse three-man turret (for the first time in the world), a new suspension system, and a quick-firing 3 pdr (47 mm/1.85 in) gun. 200 were built and phased out for training in 1938. The next Medium Mk.II was mostly similar. Production stopped in 1934. Many were reactivated and served in secondary duties during the early phases of WW2. They were slow, badly protected and their suspension too weakly built to sustain any damage. 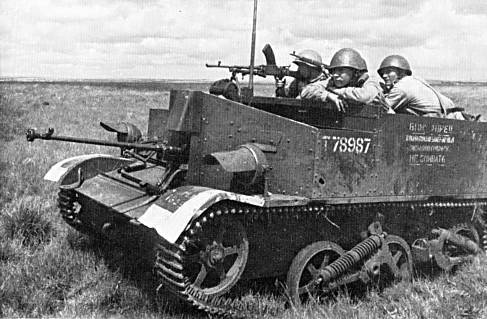 Probably the most successful of all tankette derivatives, the famous “Universal Carrier” was mass-produced to such an extent that it became the prime scout and armored mover of all Commonwealth forces, being largely supplied to the Soviets (like in this picture), Free Polish, Free French and other allies during World War Two. It was very fast, reliable, but lightly armed and protected only against small arms fire. It was also produced and used in large numbers by the Canadian army. The Matilda I was a new generation specialized infantry tank. But this cost-saving model was quickly replaced by the much more efficient Matilda II, which became famous during the early phase of the war (1940-42) in Africa. Although very slow, its armor could stand against everything except the deadly German 88. Conceived as the Tank, Infantry, Mk. III, the Valentine was a compromise between the speed of the Cruiser IV and the sturdiness of the Matilda II. It was declined into eleven versions throughout the war, with a total production of 8275, the biggest British wartime tank production ever. The Churchill was the last infantry tank. This good all-around heavy tank was at the forefront of the British armored force from 1943 to 1945. It started with teething problems in 1941, and failed miserably at Dieppe. However, in Tunisia, this model proved its superb climbing abilities and out of the ordinary sturdiness. It was used for any kind of support and genie missions imaginable. The Cruiser I was the first of a long line of early cruiser tanks, a new breed of cavalry tanks designed to exploit a breakthrough. Unfortunately, their top speed was unsatisfactory since they had a classically sprung suspension. The up-armored Cruiser Mk.II, was too slow to operate effectively as a cruiser, but the Mk.III and Mk.IV, featuring a Christie-style suspension, were a real improvement and regained the edge. The Cruiser Mk.IV was very similar to the Cruiser III, apart from the turret design. Very fast, it appeared ideally suited for desert warfare. The Cruiser V Covenanter (named after the Scottish Presbyterian movement) was a much-improved evolution of the Mk.IV. Production was first ordered in April 1939, featuring innovations like an opposed-piston engine, the front placement of cooling radiators, and the wide use of welding for the hull construction. However, it was kept chiefly for training, and inspired the more famous Cruiser VI. The Cruiser VI, better known as Crusader, was the most famous cruiser tank using the revolutionary Christie suspension. Its top speed largely compensated for its light armament and average protection. It was, however, the war horse of many operations throughout the North African campaign, and one of its most distinctive symbols. Although similar, the Cruiser VIII Centaur and Cavalier differed by the choice of their engine. They had a new QF 6-Pdr (57 mm/2.24 in) gun and good protection, while retaining a low profile and excellent speed of previous cruisers. The Cruiser VIII Cromwell was the one fitted with the Rolls Royce Merlin engine, and most successful of the three. It was introduced in 1943, declined into many variants. It soldiered until the end of the war. The Cruiser VIII Challenger was based on the previous Centaur/Cromwell, but fitted with a devastating 17-Pdr (76.2 mm/3 in) gun. Although promising and liked by its crews, it was dropped in favor of the Sherman Firefly. Developed after a long line of Crusader successors, the Comet was the last of this “cruiser” generation, and the best overall. It arrived in late 1944, ready for post D-Day operations in Europe, and opening the way for the postwar generation of British tanks led by the legendary Centurion. The 17 pdr (76.2 mm/3 in) Archer, built over surplus Valentine chassis, was a British SPG tank destroyer. It was designed to make use of the 17-Pdr in its original form, but had it mounted facing the rear of the tank. 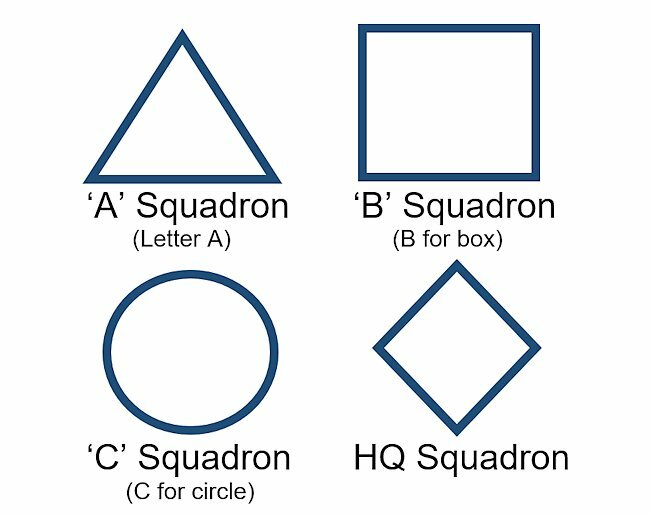 British tank squadron markings. The color changes depending on the regiment, but they normally used the same shapes. 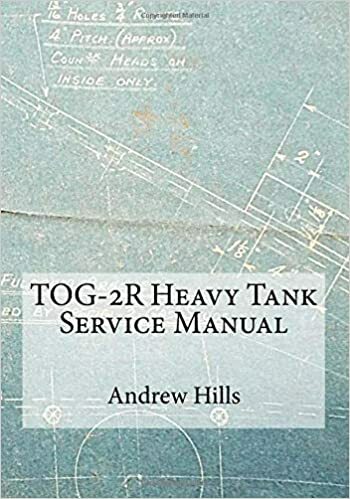 Service Manual for the British Super-Heavy tank TOG-2R. Pieced together from surviving records this manual was written in sections during the long development of the tank and was stopped when the project was terminated. As such the manual is incomplete but has been recreated as close as possible to what the original manual would have looked like had the tank entered production. 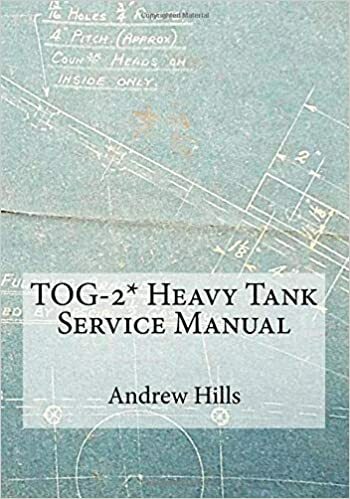 Service Manual for the British Super-Heavy tank TOG-2*. Pieced together from surviving records, this manual was written in sections during the long development of the tank and was stopped when the project was terminated. As such the manual is incomplete but has been recreated as close as possible to what the original manual would have looked like had the tank entered production. 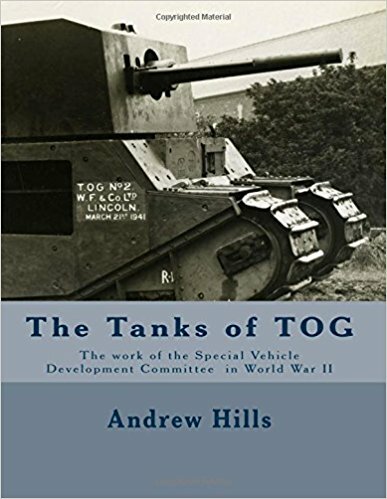 The previously untold story of the Special Vehicle Development Committee, better known as ‘The Old Gang’ or by the abbreviation ‘TOG’. The SVDC managed in very short time to design more than one vehicle to accomplish this seemingly impossible task and built tanks bearing their acronym as TOG-1 and TOG-2. Nice photo of the A34 Comet on this page, but I can’t seem to find this tank’s own entry!? I take it this site is a work in progress? I do hope the Comet gets its own page someday; it deserves one more than some others here, IMHO. Nice reference site. Yes, every vehicle will get an article sometime in the future. What happened to the Tortoise self propelled gun which was sent to Germany for trials in 1948? Two were used for practice targets and destroyed. 1 is in a museum. That leaves three unaccounted for – the one that was sent to Germany and two mysteriously @missing@. This is private interest and not for publication. What is an Ariel flag? Hello Mr. Barratt. There was Such a vehicle, a prototype built on the Chassis of the Tetrarch. A Tetrarch Article is in the works, so it may just debut on there. However I don’t know what happen after they built it.I only know one is preserved in bovington tank museum. 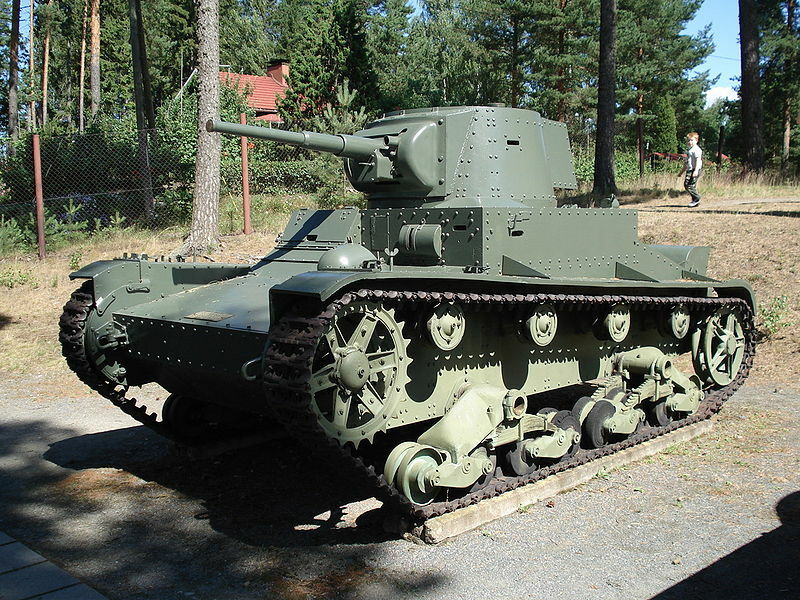 The Vickers 6 ton above is actually Finnish, armed with a Soviet 45mm, not Portuguese . Yeah, that 6-ton is in Finland, same with a T-28E. Also, maybe the Birch gun? If not a separate article, may I suggest it to be in the Vickers Medium Mk. II article? It was actually a great artillery, I would love if you guys did an article on it. Could you do an article on: the alecto, the avenger, the challenger(separate), The harry hopkins if not all? I have a photo of my father who was in the RHA sitting on a tank in 1944/5 and from your information I see it was a Cruiser Vlll Cromwell . How interesting but he was a L/Bdr and the company clerk and kept out of dangerous situations hence my birth in 1947! the 6-pounder is a 57mm. The 76.2mm described is the 17 pounder, which wasen’t mounted on the (regular) cromwell. Thanks for letting us know, it was corrected! Thanks for the article, was very enlightening. So I was wondering if the Churchill Gun Carriage will ever get its own page. Seeing as how it was a big step for the brits to mount a large caliber gun in a superstructure on a churchill, id say it deserves some love. Actually, the article is already published! Is it just me or does the Matilda II not have a page? I’m afraid it’s you! http://www.tanks-encyclopedia.com/ww2/gb/Infantry_Tank_Matilda_II.php. I wonder if anyone can help me please. I have 3 Questions. When they shipped Sherman tanks to England, and transported them on the railways. Did they remove the Machine guns from the tank ? what colour where they painted? and did they have any marking on the tank. Hope someone can help me with these questions. They didn’t have the machine-guns mounted it seems. They were probably painted in olive-green, as most US tanks. Probably few markings until their units applied them.